RABBIT Running for Six Steps (For PCs) or RABBIT Running for Six Steps (For MACS). The flight time is approximately 100 ms. Our safety system shut off power at the seventh step when tracking error on the stance knee exceeded pre-set limits. There was not sufficient time to determine the source of the problem. Sustained running was not achieved. Experiments conducted 23 and 24 September 2004. Participants included Eric Westervelt, Gabriel Buche, Ben Morris, Christine Chevallereau, and Jessy Grizzle. The freeze-frame photo clearly shows the flight phase that is characteristic of running. We had no trouble initiating ballistic motion. If you watch the feet closely, you will see some movement. Since RABBIT's lateral support comes from a bar, it evolves in a plane that is tangent to the surface of a sphere. As the hip height varies throughout the gait, the distance of the feet to the center tower must vary. C. Chevallereau, E.R. Westervelt, and J.W. Grizzle, Asymptotically Stable Running for a Five-Link, Four-Actuator, Planar Bipedal Robot, Pre-print, paper submitted to IJRR. Paper submitted May 28, 2004. [Supplemental Material]. C. Chevallereau, E.R. Westervelt, and J.W. 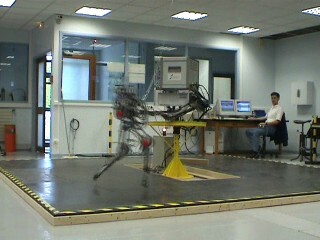 Grizzle, Asymptotic Stabilization of a Five-link, Four-Actuator, Planar Bipedal Runner, Pre-print, CDC, December 2004. Paper submitted March 5, 2004. [Supplemental Material].